When it comes to your upcoming trade show, there is a lot for you to think about—from pre-show promotion to everything you need to bring to make your display stand out. But what can really help draw in your audience, ensuring they stop to talk instead of casually glancing and walking past, are your promo items. Promo items help your prospects remember who you are after the show, ensuring your brand is kept top of mind. So, while it might be easy to buy large quantities of cost effective or generic promo items, you need to find a way to stand out. Think about what the other vendors at your event are going to be giving away. Will your item be duplicated across multiple booths? Is it too common or expected? You don't want to be giving your best prospect their tenth company pen of the day. 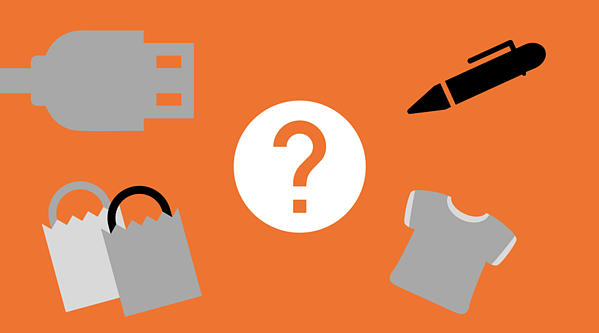 When deciding on what promo items to gravitate towards, think about what your target market would want from you. What would your ideal customers REALLY get excited about? What would cement your name in their memory once they go home or go to work the next morning? How do you separate the winning items from the losers? First, let's talk about what not to do. Certain promo items may be inconvenient, not likely to be kept post show, or simply not memorable. Items that are too big. People attending the trade show are not interested in something that’s too big to carry around while they’re at the show or too big to pack and take home with them. So try to stay away from those oversize posters and bulky products that can’t easily be stuffed in a purse or in the show tote bag. Items that are too heavy. In addition, don’t give away prodcuts that are too heavy. Attendees may be polite and take one to go, but as soon as they walk away they’ll toss it in a bin. If your awesome swag is incredibly intriguing and a must-have product, offer to mail it to them. Take their business card or collect their contact information and ship the item post-show. This is also a great way to get their contact information for future business. Everyone already has a favorite water bottle and large quantities of pens and pencils around their office and home. Stress balls don’t really help with stress and most people don’t use them. And the small, off-the-shelf calendars (the kind you used to get at a bank) are never used and are out-of-date (we use our phones and computers for that anyway). You don’t want to give someone a gift they already have, so why would you give them to your potential customers? Now that you know what to avoid bringing, what should you look for in a winning promotional item? Identify the type of attendees that are going to be there, and any sponsored activities during the event. You want your prospects to be able to use the product in everyday life or provide an item relevant to their current activities. Are you targeting millenial women? A high end, quality tote bag may be a good fit. Is the conference hosting a golf event? Branded golf balls or sunscreen might be just the thing. Is the event lasting several days with multiple break-out sessions? Maybe a portable phone charger will get a ton of use while folks are attending back-to-back sessions. Items that offer something personal. Everyone loves personalized items with their name on it. If you get a list of attendees ahead of time, prepare personalized promotional products with their names on it. This will definitely make the attendees remember you long after they leave your booth. Items that relate to the location. Give them something that has to do with the city the event is being held in. If the trade show is being held in a big city, give them a map or a list of the best restaurants or tourist attractions to go to during their stay. Or give them a useful item to use while they are there. For example, its awfully hot in Vegas, so a cooling towel or a plug-in cell phone fan may be just the thing to draw a crowd to your booth. Give them a chance to win something big! Give them a chance to win a prize ranging anywhere from the latest tech gadget to a fabulous dinner for two to lottery tickets. A raffle will incent people to interact with you and to revisit your booth to see if they've won. Give them something everyone could use. You want to give out a product every potential customer can use. Maybe that's something simple and useful like a USB drive, remote control camera shutter (selfie sticks are so 2016), or a loop phone strap? Or maybe that's a special treat like fresh chocolate chip cookies or M&M's printed with your logo? Or how about providing a service or experience? Think about providing a shoe shine booth or offering a Virtual Reality (VR) experience. Make sure you take the time to decide what promotional items you want to bring to your next trade show so you pick a winner. Then your investment in promo items will pay off with a winning item that your booth visitors will be sure to talk about. Need help with tradeshows or events? Learn more about our full service tradeshow solutions, and request a demo.